← Lighting a Lighter Because Apple ROCKS: New iPods! When a Meme Gets Actually Funny – The Laugh-Out-Loud Cats.. If you aren’t aware of the LOLCATS meme that the cool kidz are having fun with, well, go to the link and like, “get it,” dig? But more importantly, go look at the wonderful re-appropriation of a super silly meme by Adam Korford and it’s like, genius. 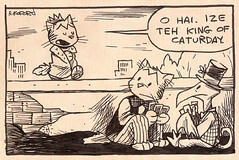 The combo of illiterate LOLCATS BS with old-skool comics makes for super fun. Enjoy, and if LOLCATS silliness isn’t your think maybeseeing that really awesome movie with Clive Owen and Monica Bellucci is?